If only completing a puzzle was as easy as waving a magic wand! 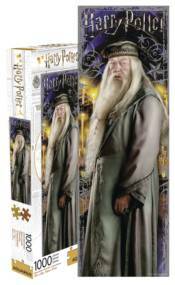 Some of your favorite Harry Potter characters are featured on this beguiling 1,000-piece puzzles that measure 12' x 32' when complete. Choose from Albus Dumbledore, Harry Potter, Hermione Granger, and the Undesirable No.1 Wanted Poster.